Wu, Xinyuan and Wang, Bin 2018. Recent Developments in Structure-Preserving Algorithms for Oscillatory Differential Equations. p. 107. Myerscough, Keith W. Frank, Jason and Leimkuhler, Benedict 2017. Observation-based correction of dynamical models using thermostats. Proceedings of the Royal Society A: Mathematical, Physical and Engineering Science, Vol. 473, Issue. 2197, p. 20160730. Mergel, Janine C. Sauer, Roger A. and Ober-Blöbaum, Sina 2017. C1-continuous space-time discretization based on Hamilton's law of varying action. ZAMM - Journal of Applied Mathematics and Mechanics / Zeitschrift für Angewandte Mathematik und Mechanik, Vol. 97, Issue. 4, p. 433. Siddi, Lorenzo Lapenta, Giovanni and Gibbon, Paul 2017. Mesh-free Hamiltonian implementation of two dimensional Darwin model. Physics of Plasmas, Vol. 24, Issue. 8, p. 082103. Minesaki, Yukitaka 2017. n-gon Equilibria of the Discrete $(1+n)$-body Problem. The Astrophysical Journal, Vol. 835, Issue. 2, p. 253. Chadaj, K. Malczyk, P. and Frączek, J. 2017. A parallel Hamiltonian formulation for forward dynamics of closed-loop multibody systems. Multibody System Dynamics, Vol. 39, Issue. 1-2, p. 51. Chadaj, Krzysztof Malczyk, Pawel and Fraczek, Janusz 2017. A Parallel Recursive Hamiltonian Algorithm for Forward Dynamics of Serial Kinematic Chains. IEEE Transactions on Robotics, Vol. 33, Issue. 3, p. 647. Leimkuhler, Benedict and Matthews, Charles 2016. Efficient molecular dynamics using geodesic integration and solvent–solute splitting. Proceedings of the Royal Society A: Mathematical, Physical and Engineering Science, Vol. 472, Issue. 2189, p. 20160138. Marthinsen, Håkon and Owren, Brynjulf 2016. Geometric integration of non-autonomous linear Hamiltonian problems. Advances in Computational Mathematics, Vol. 42, Issue. 2, p. 313. Bartuccelli, M. Gentile, G. and Wright, J. A. 2016. Stable dynamics in forced systems with sufficiently high/low forcing frequency. Chaos: An Interdisciplinary Journal of Nonlinear Science, Vol. 26, Issue. 8, p. 083108. Albaugh, Alex Boateng, Henry A. Bradshaw, Richard T. Demerdash, Omar N. Dziedzic, Jacek Mao, Yuezhi Margul, Daniel T. Swails, Jason Zeng, Qiao Case, David A. Eastman, Peter Wang, Lee-Ping Essex, Jonathan W. Head-Gordon, Martin Pande, Vijay S. Ponder, Jay W. Shao, Yihan Skylaris, Chris-Kriton Todorov, Ilian T. Tuckerman, Mark E. and Head-Gordon, Teresa 2016. Advanced Potential Energy Surfaces for Molecular Simulation. The Journal of Physical Chemistry B, Vol. 120, Issue. 37, p. 9811. Gotoda, Takeshi and Sakajo, Takashi 2016. Mathematical Fluid Dynamics, Present and Future. Vol. 183, Issue. , p. 401. Omelyan, Igor and Kovalenko, Andriy 2015. MTS-MD of Biomolecules Steered with 3D-RISM-KH Mean Solvation Forces Accelerated with Generalized Solvation Force Extrapolation. Journal of Chemical Theory and Computation, Vol. 11, Issue. 4, p. 1875. Juri, J. E. van Dijke, Marinus I. J. and Sorbie, Kenneth S. 2015. Inversion of Lattice Network Structure Subjected to Carbonate Mercury Intrusion Capillary Pressure: Hamiltonian Monte Carlo Posterior Sampling. Transport in Porous Media, Vol. 106, Issue. 1, p. 73. Aoues, Said Eberard, Damien and Marquis-Favre, Wilfrid 2015. Discrete IDA-PBC control law for Newtonian mechanical port-Hamiltonian systems. p. 4388. Chadaj, Krzysztof Malczyk, Pawel and Fraczek, Janusz 2015. Efficient parallel formulation for dynamics simulation of large articulated robotic systems. p. 441. Leimkuhler, Benedict and Shang, Xiaocheng 2015. On the numerical treatment of dissipative particle dynamics and related systems. Journal of Computational Physics, Vol. 280, Issue. , p. 72. Geometric integrators are time-stepping methods, designed such that they exactly satisfy conservation laws, symmetries or symplectic properties of a system of differential equations. 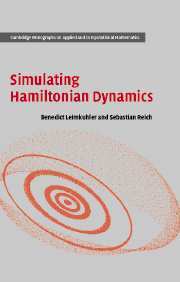 In this book the authors outline the principles of geometric integration and demonstrate how they can be applied to provide efficient numerical methods for simulating conservative models. Beginning from basic principles and continuing with discussions regarding the advantageous properties of such schemes, the book introduces methods for the N-body problem, systems with holonomic constraints, and rigid bodies. More advanced topics treated include high-order and variable stepsize methods, schemes for treating problems involving multiple time-scales, and applications to molecular dynamics and partial differential equations. The emphasis is on providing a unified theoretical framework as well as a practical guide for users. The inclusion of examples, background material and exercises enhance the usefulness of the book for self-instruction or as a text for a graduate course on the subject.